home » Ad Testing, Advertising Frequency, Advertising Schedules / Scheduling » Is Bigger Really Better? You’ve decided to run a series of newspaper ads, and the paper wants to know how much space to reserve for your ad. Is bigger always better? In terms of increased readership, yes. But it also comes with an increase in cost. You need to take both into account to calculate the return on your advertising investment. (And in the interest of keeping this post to a reasonable length, we’ll put off the “optimum size” discussion for one more installment. Today we’ll limit the discussion to variables in ad size). Depending on the section of the paper in which it’s placed, and depending on the demographic profile of the readers one is attempting to reach, the newspaper readership studies conducted by Daniel Starch And Company lead to some interesting conclusions as to size and placement of ads. Newspaper advertising is sold by the column inch. Ignoring contract discounts, and advertiser can buy a full-page, two half-pages, four quarter-pages, eight eighth-pages (you get the idea) all for roughly the same price. As we pointed out in the last post repetition is a critical element in persuasion, and running an ad twice, or four times, or eight dramatically increases the frequency of shoppers noticing the ad. A single full-page ad delivers a frequency of one. Eight eighth-page ads, assuming different pages or different days for each ad insertion, will deliver a frequency of approximately six. (See A Strategy For Frequency In Newspaper Advertising for a more complete explanation). So, why is this not an easy decision? If frequency sells, why not always buy eight one-eighth page ads instead of a single full-page ad? Because in order for an ad to “work” it must first be noticed. A full page ad is more likely to be noticed. A full-page ad is likely to be “noted” by 42% of the readers. An eighth-page by only 23%. The bigger the ad, the more people will see it. But wait a minute. A full page only get’s “noted” 43% fo the time? Does this mean that no matter what size your ad, more than half the readership will never notice your ad? Let’s be honest, nothing being advertised appeals to everyone. People who are interested in what you have for sale are the readers likely to note, or to read your ad. This is where it gets interesting. The number of people who see the ad is of lesser importance than the number of those people who, upon reading the ad, are motivated to buy from you. With enough patience, and a good tracking system, you can actually measure the impact of different sizes of newspaper or magazine ads. My good friend and restauranteur extraordinaire, Roger de la Paz, owner of Richie’s Real American Diner in Victorville, California, has that patience. 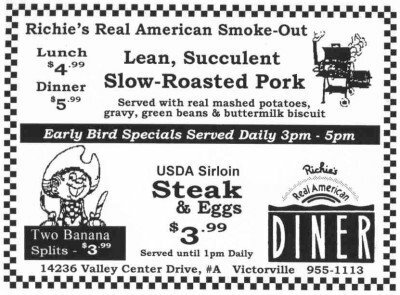 He’s been keeping incredibly detailed records of the effect of his advertising since he opened Richie’s. Roger tracks his newspaper ads with the simplest of measurements. He compares the demand for specific food items before the ad runs, and again afterward. He is then able to calculate the increased demand for specific menu items against the cost of the ads. Over a three year period, Roger demonstrated that his most profitable ad size is two columns wide by three inches deep. Ads smaller than “two-by-three” had less impact on sales. Ads progressively larger than two-by-three did increase gross sales, but not enough to warrant the additional cost. By carefully tracking the specifics of size, placement, and frequency of his newspaper advertising Roger is now able to predict to within a few dollars what Richie’s Real American Diner’s return on newspaper advertising investment will be. By the way, he regularly tests the content of his ads, too. Right now, Richie’s newspaper advertising delivers a consistantly predictable 118.06% increase in gross sales every day the ads run. Next post we’ll definately reach some conclusions about the optimum ad size for top return on investment. Until then, are you keeping track of the effect of your ads? 1 The reduction in noting scores from a quarter-page (26%) to an eighth-page (23%) is a difference of three percent when referenced to total readership. It is, however, a loss of nearly 12% of the number of people who notice the ad.